My wish of shaking the hand of the person who used to preside and serve as head of Thailand’s parliamentary government, finally became a reality on January 8, 2015. Not only did I shake his hand, I also exchanged a few words with him – and he also observed us while we were conducting our classes. 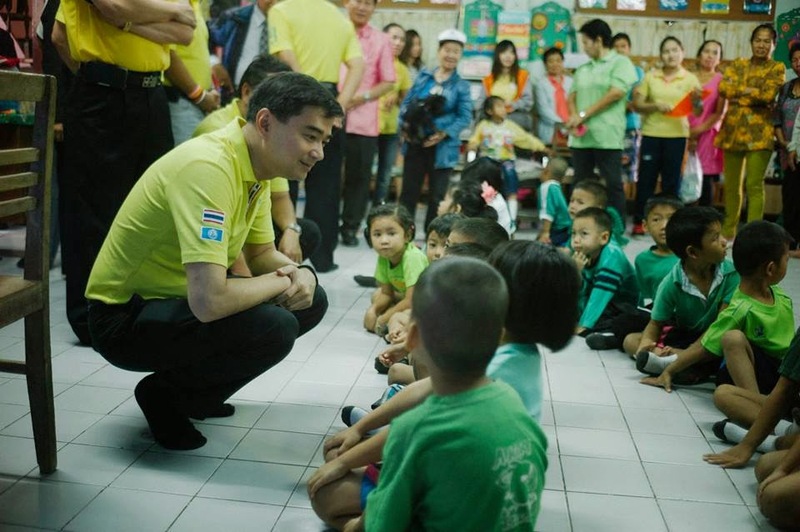 Former Prime Minister Abhisit Vejajjiva’s coming was already expected. I was given a heads up months before by former MP for Phitsanulok Dr. Warong about the date and the possible scenarios that will transpire come the time of his coming. It’s been four days since the visit but I still find it unbelievable! Standing next to someone who used to hold the highest position in the government of Thailand and having a photo with him is one thing. But exchanging a few words and shaking his hand? Whoa! It was an honor. Can’t move on. LoL. What was just a simple visit became the talk of the town. Not only parents were present, even supporters and those wishing to have a glimpse of the former PM took the moment. There were so many people. I didn’t realize it would be this big! Anyway, I’ll be posting about what happened during the visit and the moment the Democrat Party observed our classes soon. And yeah, more photos to come. Stay tuned!